Enjoy your music the way it's meant to be heard on this bargain piece of high-end audio gear. Black Friday is coming in just a few days now, and the Black Friday and Cyber Monday 2018 deals are coming in thick and fast ahead of the big day. As well as deals specifically aimed at creatives, on laptops and Creative Cloud software, for example, there are plenty of other more general Black Friday deals that creatives could benefit from. For example, nothing quite gets the creative juices pumping like putting on some of your favourite tunes, and we're certain that you're not short on ways to listen to them. You probably have a stack of albums on your phone and even more on your desktop computer, with probably a streaming service or two thrown in for good measure. But if quality matters to you then really, you need a dedicated device that can deliver high-resolution audio, enabling you to hear all the extra detail that's usually lost when your tunes get squashed into MP3 format. Sony's NW-A45 Walkman range is just the thing to give new life to your music, and it's available right now in a great Amazon Black Friday deal for just £114.99 – that's £55 off Red model, the priciest one in the range, and a solid bargain whichever colour you opt for. 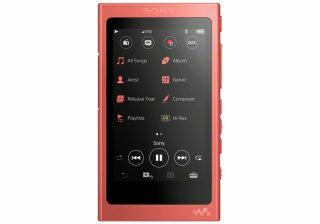 Save £65: This Red version of the NW-A45 gives you better than CD quality audio wherever you are, with up to 45 hours of playback and easy Bluetooth connectivity. It's also available in Black, Gold and Blue. The NW-A45 is designed to deliver better than CD-quality sound, with support for pretty much every audio format from nasty old MP3 through to heavyweight audiophile formats such as FLAC, DSD and Apple Lossless. It'll work with standard headphones or over Bluetooth, using LDAC for improved audio quality, and it'll give you to 45 hours of listening on a single charge, as well as 16GB of storage for your music that you can extend using the NW-A45's micro SD slot. Finding your tunes is nice and easy thanks to its 3.1-inch touch-sensitive screen, and it comes in a range of colours to suit your particular style. Perhaps the biggest advantage of it, though, is that by shifting your music onto the NW-A45, you'll create lots of extra space on your phone for the best iPhone apps, which is always a bonus. Want a taste of sweet high-resolution audio? Now's the time to jump on it; Amazon dropped the price of the NW-A45 at midnight in advance of Black Friday, but it won't be around forever, so don't hang about.